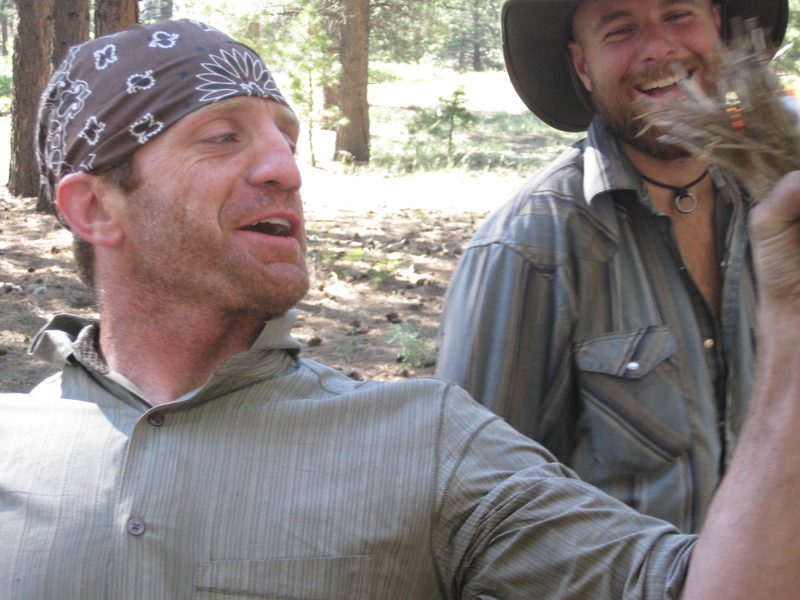 Desert DAWN is pleased to provide a curriculum steeped in the woodcraft traditions of American outdoor life. Our curriculum is inspired by the works of woodcraft authors who wrote and taught over a over a century ago. Authors like George Sears a.k.a. 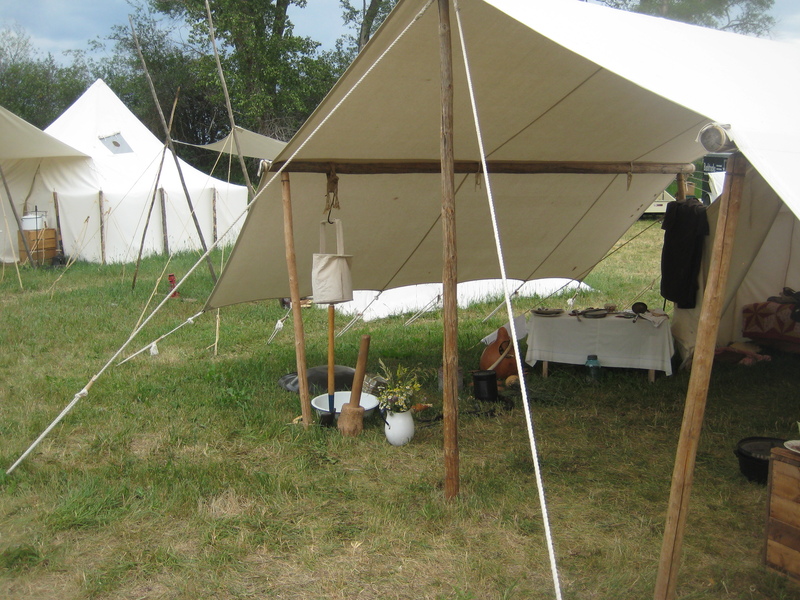 “Nessmuck”, John Gould, Horace Kephart, Stewart Edward White and Daniel Carter Beard started a movement of camping that today is known as woodcraft camping. “Woodcraft is the ‘knowledge and skill in such things as belong to woodland life and occupations’… But among woodsmen it is understood to be particularly the faculty of ‘being at home’ in wilderness; of living on intimate terms with nature; not only of knowing her innermost secrets but also how to use those secrets for the forest-dweller’s comfort and safety. The appreciation of making a fire the old fashion way, with an ember and kindling (note the small red glow in the kindling). This Bic never goes dry. Woodcraft is the skill of using your hands and basic tools to build or make items from materials found in nature. From the camping perspective, these skills relate primarily to items needed to travel through nature – Trail Craft – or items needed to function in a camp – Camp Craft. Woodcraft skills allow you to interact and connect more with nature. Our curriculum focus on basic camping technologies and versatile gear instead of single purpose gear, for instance basic cordage can be used to tie up a pack make a shelter or hang a bear bag where as webbing and quick release buckles on a modern backpack are only available to cinch the pack tightly. Learning traditional woodcraft skills is not only fun and exciting it is also liberating. In the days when gear was simpler, these basic skills were relied upon to stay comfortable in nature. Today, being liberated from all the modern gear items and gadgets sold in the outdoor stores will allow you to enjoy nature at a whole new level. These basic woodcraft skills include Rope Craft, Knife Craft, Fire Craft, Shelter Craft, Pack Craft, and Trail Craft Camp Craft and Nature Craft. Several skills have rope craft as a prerequisite – pack craft, shelter craft and camp craft for starters. We focus on rope care and maintenance and the key knots that every camper should know. The skills of lashing and rope splicing are taught for the benefits they provide around the base camp. 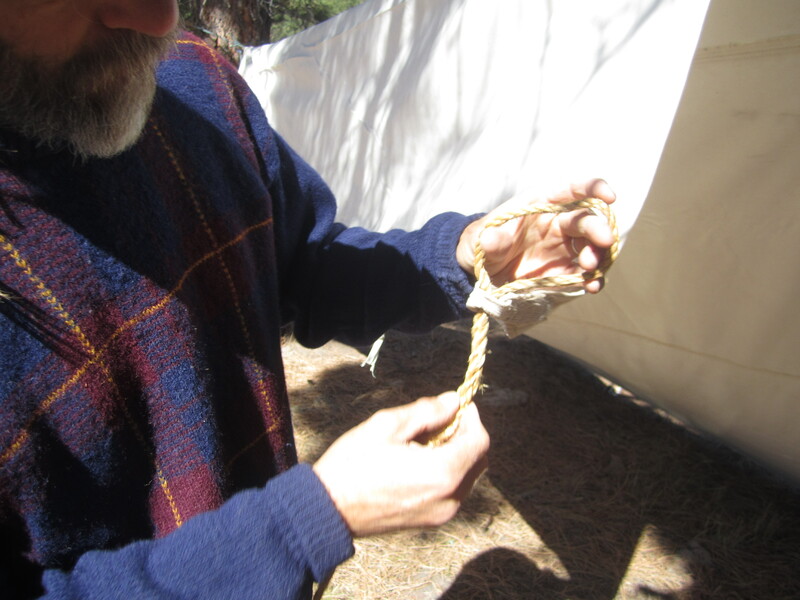 “A knot should be easy to tie, easy to untie and it should look good.” Learning the appropriate knot for a purpose makes it possible to use knots that will come out of a rope instead of a jumble of knots that eventually bind and need to be cut to be undone. Knife craft is another skill that has many applications – from making eating utensils to preparing fire wood to making a friction fire set and trap sets. You will come to value your field knife. Simple, strong and versatile – the field knife is one of your most valuable tools. We begin the knife lessons with knife safety. We then cover knife use and demonstrate several key knife strokes that will help you accomplish most tasks. Finally, we will teach how to sharpen your knife. (Never again will you be frustrated with the inefficiency of a dull knife.) And then we go to work making tools and utensils that will make our time in nature even more enjoyable. As we roll into camp, we will certainly want to cook a hot meal. 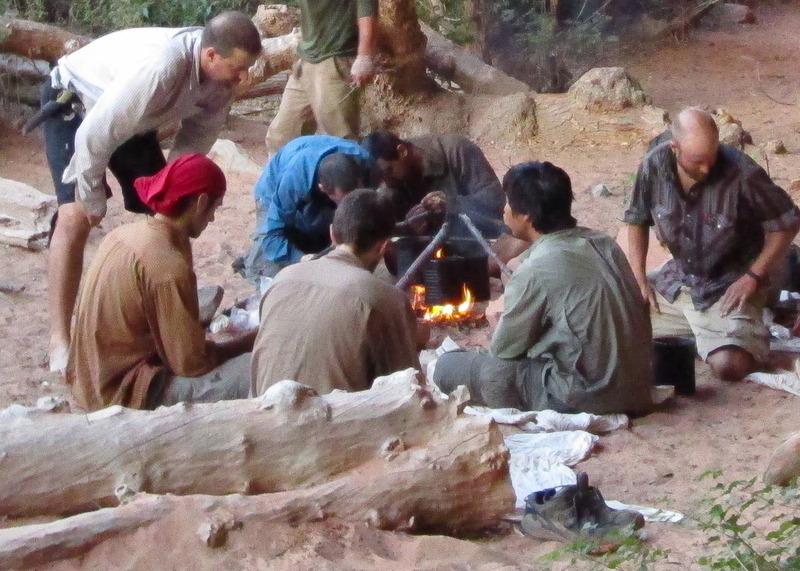 The open fire is the classic way to cook and the fire provides amazing social time in the evening. 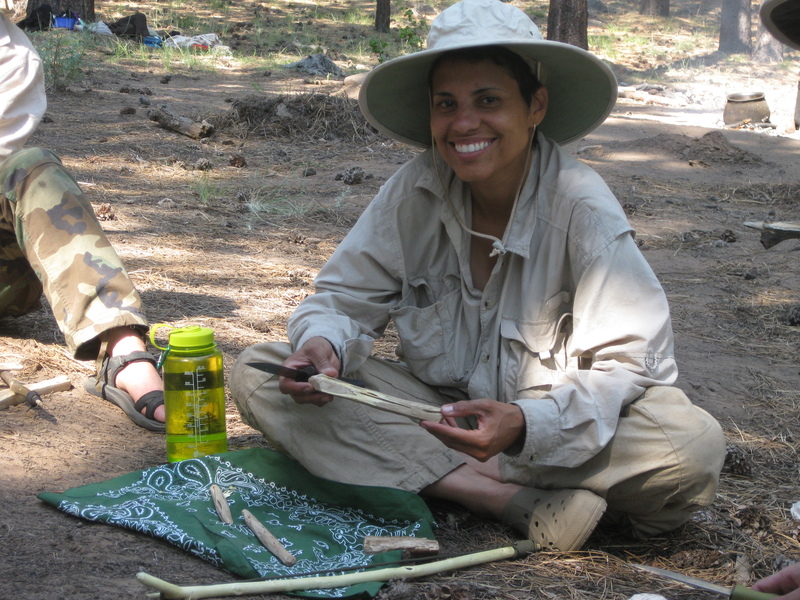 We use friction fire methods to help students gain an excellent understanding of how to start a campfire. 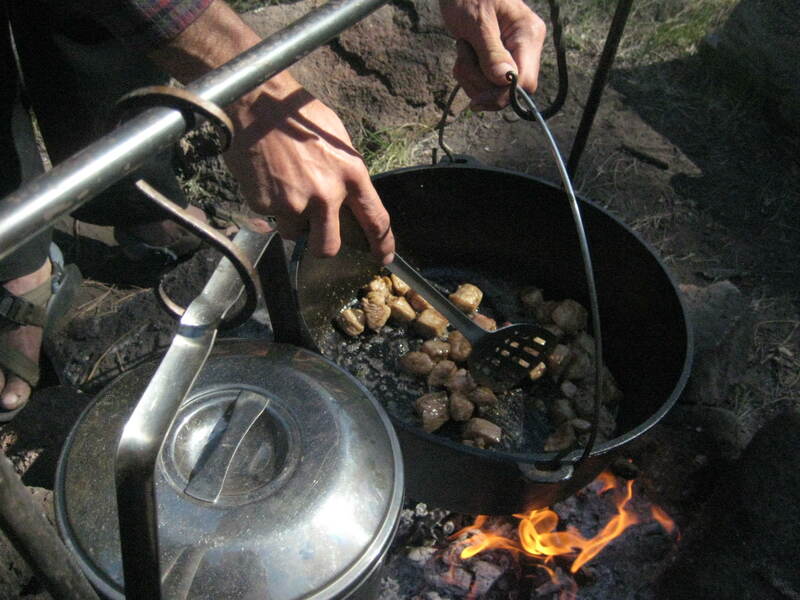 Then we move to flint and steel and other classic camping methods for starting fires. Cooking is a primary use of fire and with basic gear and simple ingredients we will satisfy our palates and our appetites. Since safety is key we teach methods for using fire safely and ethically. Before we leave we will remove all traces of our fire and take steps to restore the ground were we cooked. Being well fed and having plenty of exercise and fresh air, we will be ready for a good nights sleep. Our nightly nest will provide us with this. On our Trail Crafter Courses, we will use a few items that we carry and what nature provides to create this nest. The goal is to stay comfortable, warm and dry throughout the night. On our Camp Crafter Courses, we stay at base camps and learn the ways to form canvas tarps into shelters and the methods for setting up constructed canvas tents. 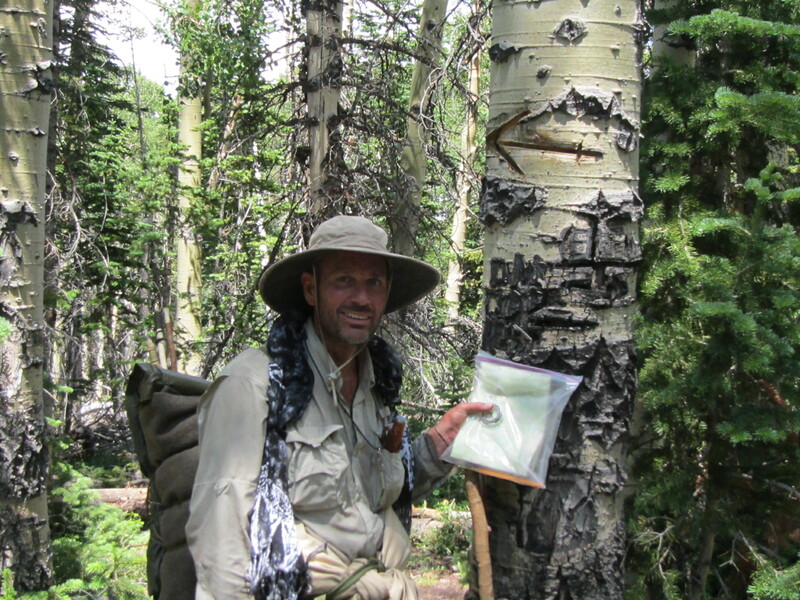 Hiking with Classic Trail Camping self-made packs – one using dimensional lumber and canvas and the other using willows and rawhide. 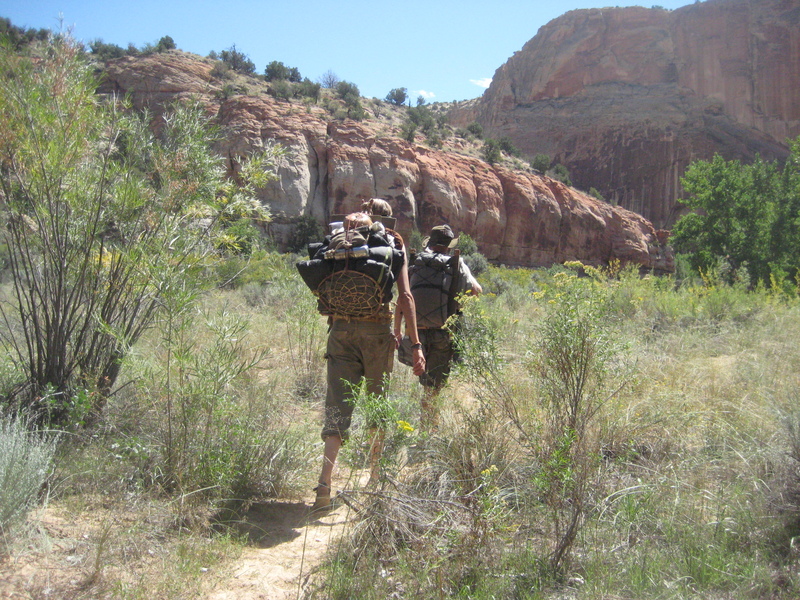 On our Trail Crafter Courses we begin our journey by learning various methods to carry our gear without the use of a backpack. For this we go back to the time before backpacks and sleeping bags and tents. In those days gear was simple and basic and the items themselves provided the solution for how to carry the gear. The blanket became gear wrapping and with cordage and webbing a packing system was configured. We also use a flat piece of cloth to fashion various forms of a small pack to carry small items for quick access during the day’s hike. Flat cloth is a time tested carrying device that has been used all over the world. Desert DAWN adopts these two methods primarily for the versatility of the pieces of cloth that are used for the systems. Staying Found using Map and Compass and a little help from a trail marker. Trail Craft is the skills used in hiking the trail. Primary among these is Map and Compass Navigation, though knowledge of trail safety and ethics is also valuable. You learn the classic navigation methods that have been accurately used for over a thousand years, no GPS required. More than navigation though we look at how to determine a route based on map information and knowledge of the land and vegetation. As with other crafts we will also learn ethics of trail travel that will help us travel through an area and leave only the slightest sign that we passed through. Trail craft also involves trail safety, which addresses how to traverse the various terrains in which we travel. The trail craft skills are taught primarily in our Trail Crafter series of courses. Camp craft skills are the skills that relate to life in camp. Camp life is often centered around the camp fire. You learn the many functions of a camp fire, from various cooking methods to producing tools and implements using the fire. The camp fire is also the center of camp entertainment. Camp craft is more than the campfire. Camp craft involves the camp layout, camping hygiene and camp safety. In camp is also were there is more time to focus on the wood working aspect of woodcraft. The knife, axe and buck saw are the primary tools for fashioning items to make camp life a bit more comfortable, whether whittling a spoon, carving a bowl or constructing a camp table. The camp craft skills are the primary focus of our Camp Crafter series of courses, however basic camp craft skills are also covered in the Trail Crafter Courses. 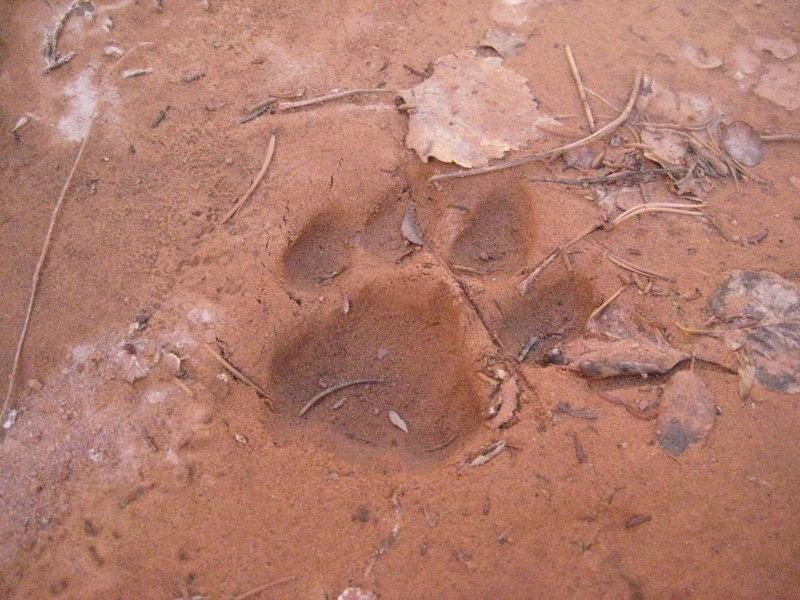 Track of a mountain lion in the mud tells part of the story of its recent travels. Nature Craft is the art of observing nature and understanding what your observations tell you. Nature provides many gifts. The simple beauty and serenity of nature is the primary gift, however, understanding the resources that nature provides and how to locate these resources is a valuable part of the wood craft traditions. You learn plant recognition skills and the uses of various plants for cordage, shelter, tools and food. We also look at animal signs – tracks, rubbings, beds and burrows– and what they tell us about the animals inhabiting the area. Nature craft is more than just plants and animals. We look for information on the weather, water resources and geologic resources to help us as we spend time in nature. The nature craft skills are taught on all of our courses.